“Oh no!”, I hear you groan, “She is not at it, again!” Yes, I am afraid, I am. Horst and Renate (my neighbours) have gone on a small holiday to check out the wild flowers. Luckily, before they went, I sneaked in a “Can I pick some of your cumquats while you are away?” request. I really liked it but, be warned, it is quite intense. This sauce would be perfect with duck or something a bit stronger than chicken. 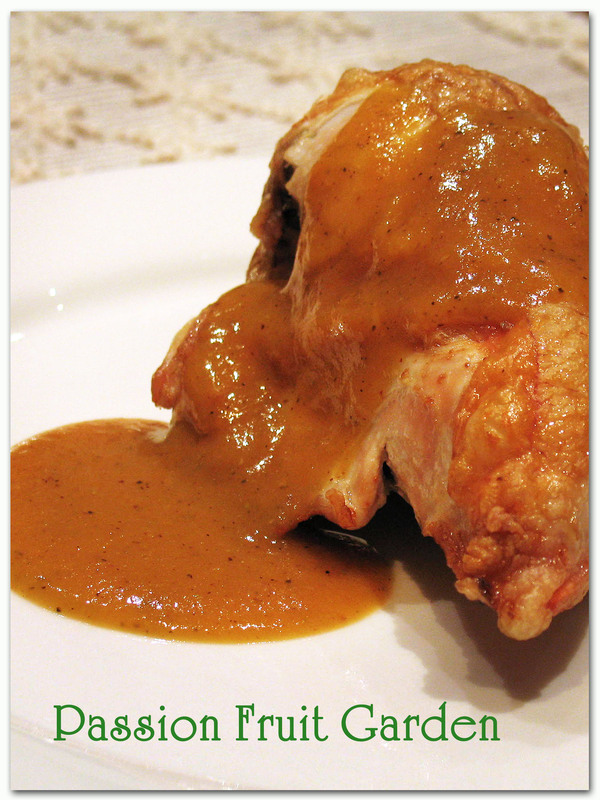 I served it with chicken breasts and the sauce was a wee bit overpowering but, to my taste, lovely. For those who are not really big on pepper, you may wish to reduce the amount. When I first tasted the sauce (in the pot), I thought there was too much pepper (which is saying something since I am very big on pepper) but it very quickly mellowed and, when served, I thought it was just right. This recipe is from the Australian Women’s Weekly Fruit and Vegetable Cookbook. Combine all the ingredients, except the brandy, in a saucepan. Bring to the boil. Boil rapidly, uncovered, for 10 minutes. Reduce the heat, simmer uncovered for about 15 minutes or until mixture begins to thicken. Blend or process cumquat mixture until almost smooth then strain. I used a spoon to push out as much pulp as possible. I am not certain if this was intended but the sauce had the right consistency. Place strained mixture in clean saucepan over heat. Bring to the boil, reduce heat and simmer uncovered for about 10 minutes or until sauce thickens slightly. Serve with poultry – I think duck would be perfect. This entry was posted in Chicken & Duck, Cumquats, Cumquats, Eating your bounty, Preserving the bounty, What's for dinner? and tagged Citrus sauce, Cumquat sauce, What to do with cumquats?, What to do with excess cumquats? by Glenda. Bookmark the permalink. Cumquat – citrus and pepper – I think would be a great combination. I will look out for cumquats, as I have a good source of duck, but I think maybe even with fish this sauce would be good. Hi Ella, I have bought a duck to see how it goes with it. I am sure it will be perfect. I know what a cumquat is but I don’t think I’ve ever seen one in our markets here. I know I’ve never tried them but they sound good to me, especially in a sauce. You’ve got nice neighbors too. Hi Diane, We don’t see them in the market here but a lot of people grow the tree in a pot as it is very ornamental and small. That is why I am trying to encourage people to use their fruit. It is just a pity to waste it. Hi John. They will be in season when oranges, lemons etc are in season. They appear, however, to ripen a little later than most citrus and hold on the tree extremely well. Last year, I picked some of Renate’s that were still on the tree in early summer. They are not to everyone’s taste fresh. The skin is sweet but the flesh a little tart – a great combo if you ask me. Because the tree is so ornamental, in Australia, many people grow them in pots on their verandahs, most however, don’t use the fruit which is a pity. It would make a lovely marmalade, you can soak them in brandy or make a cumquat syrup with them. I get a little exasperated with people who don’t use food that is (literally) at their front door. Nice to have neighbours who allow you to forage! Hi Lisa, It sure is. BTW, I got some Bragg vinegar.